Do you add decorations to your home for the spring time? Most of us decorate our homes for the autumn and winter holidays (summer for those of you down under). But often we get busy with, well, life! Too busy to think about some visual treat for our homes. And I am one of those persons. I've been far too busy to consider what a delight to the eye can do for my mood. Yes, I'm suggesting a little spring decor as a mood enhancer. Skip the Prozac! Give me a fun craft that results in something of beauty to add to my home. 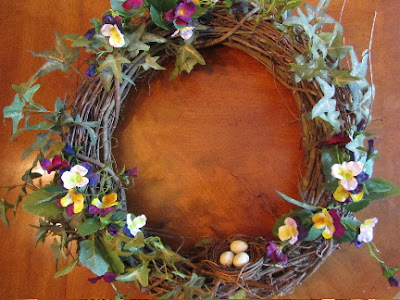 Having recently been inspired by Jemma's blog At Home With Jemma -- Jemma's Easter Table and Spring Decor Updates, and her lovely springtime decorations, I finally became motivated to make something that has been on a back burner for several years, a springtime wreath. You see, we have a spot in our entry hall which holds an autumn wreath of dried leaves and gourds in fall, a faux evergreen wreath in the della Robbia style for Christmas, and a seashell wreath for summer. It's been my custom to replace the Christmas wreath in early January with the summer wreath, which just seemed wrong to me. I had vowed to make a springtime wreath that would double as Easter decor, but still remain up until summer actually started here. 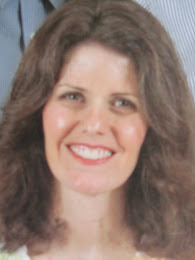 Most years, I was bogged down with taxes, 4 springtime birthdays, and the Easter celebration itself (and all the surrounding activities). 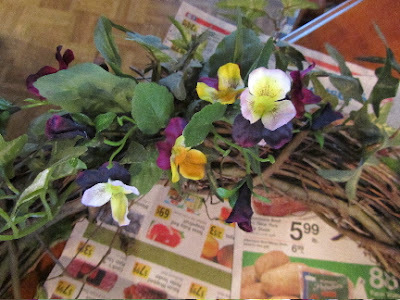 This year, I finally realized how much joy I would have in choosing items to make a springtime wreath. And equally important, that my joy was important, too. Last Friday afternoon, one of my daughters needed a ride to the fabric and craft store to pick up some trim. Perfect opportunity! I browsed the floral department, thought and rethought many possibilities. Ultimately, I decided that I wanted something very natural looking, using items that spoke "spring" to me -- a bird's nest, pansies or violas (the artificial violas actually looked the most realistic to me), moss (living in the Pacific Northwest, moss is part of the natural landscape), and English Ivy, in particular, needlepoint English Ivy. 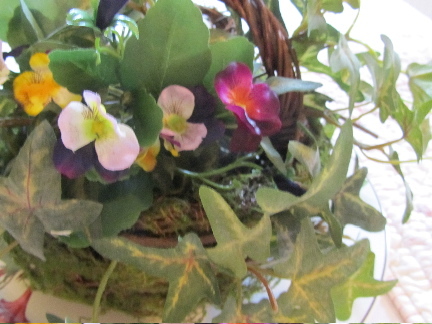 I also remembered a small basket that was part of a flower arrangement I'd received a couple of years ago. I saved the basket, knowing I would someday do something with it. 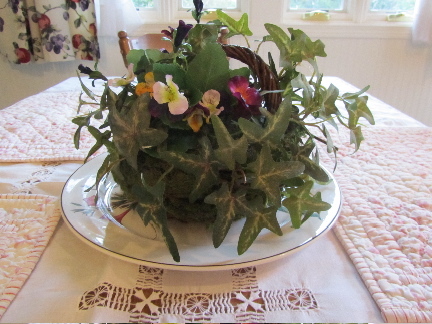 I'll use the leftover bits from the wreath to make this basket centerpiece for the kitchen table. 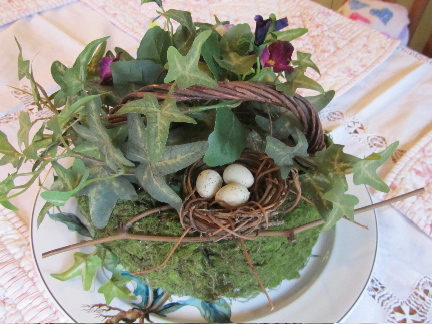 With the basket, I wrapped the base of the basket in moss, then pinned ivy over the moss, added some violas and another tiny bird's next with eggs. and on the other side, the violas. For wreaths, identify where the top is going to be, before you begin. Place a hook made of wire in this spot, on the back side. As needed, you can hold the wreath up as you work, to see if everything is placed how you want it. Near the end of your work, find a nail on the wall to hang the wreath, so that you can make sure what you want to be visible, will be visible. I needed to adjust the tiny bird's nest, so that it could be seen from below (this wreath will hang up high). I use floral wire for most of the work, but I also use flexible craft cement, (the goopy stuff that is rubbery when dry). If you ever want to get the cap off again, leave the tube open, on top of some newspapers (it will ooze), until you are all done. Then, take a paper towel or disposable piece of cloth and wet with rubbing alcohol, and wipe the applicator tip clean. Now, seal with the cap. To get your hands clean, a bit of vegetable oil rubbed into the rubbery stuff on your fingers is a non-toxic way to remove this stuff. You still may need to pick bits off. 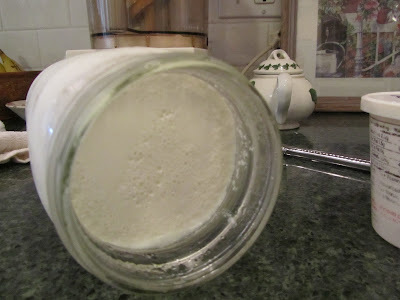 Alternatively, fingernail polish remover will also dissolve this type of craft cement. To get the most bang for your buck with those small floral picks (that look like tiny bouquets), spread the tiny floral stems apart and you will almost double the size of your floral pick. While I bought almost everything for these projects, there is a frugal side. 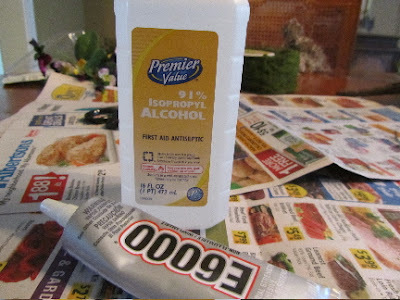 I'll use these items year after year, so this is a one-time investment for decor for the home. And secondly, I had coupons! Lots and lots of coupons! Every single item I bought either was on sale already, or I had a 50% off coupon I could apply. Which just goes to show you how much of a markup fabric and craft supply stores have. I really try to never buy anything in those stores that's not either on sale or that I don't have a coupon that I could use. In addition to making this basket and wreath, I already had a few Easter items to set out. Among them, these chocolate bunny molds. 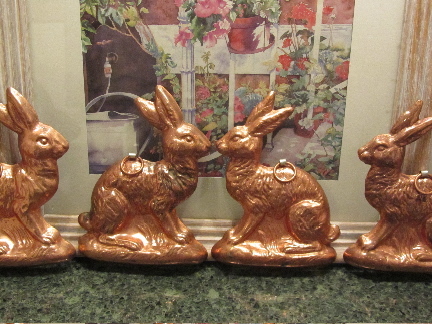 I put them in my main work area of the kitchen, as I'm the one who will most appreciate some spring decor. I have a theory that all mankind is designed to create. That this is a part of man being designed in God's image. Some of us create directly with our hands, others use traditional tools, many create in their gardens and kitchens, and others yet, create with technology. We all have it in us to be creative. What have you been wanting to make, but have been putting off? If you made the time to create this special item(s), would you find joy in the process, as I do? What is your favorite type of crafting, redesigning, or needle work? Your decorating brings me joy too!! All of your darling goodies represent Spring! 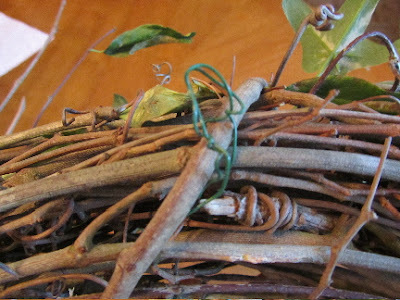 I love the grapevine basket covered in moss and sweet birds nest. Your grapevine wreath is a perfect addition to your decor and I really like the cohesiveness of your two Spring projects! I love the northwest and both of your creations embody the essence of the area. And yes add a little bird! I love birds!!! Thank you for your very kind mentioning of me!! Have a perfectly joyous day! Thank you! I adore birds, as well. I'm hoping Hobby Lobby has something that suits my taste. You've made some beautiful spring crafts, Lili. 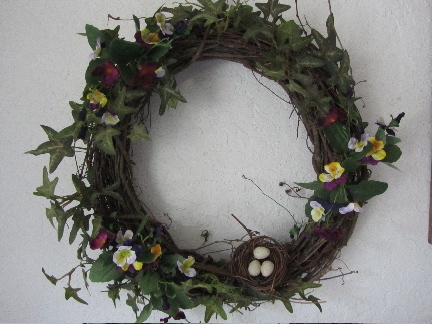 I really like the wreath and the little bird's nest on it. I'm glad you like them. I tried to replicate what we see in our area here. Bird's nests are so precious to me. In spring, I like to watch the birds build their nests. For the past 2 years, a bird has come to an overgrown bush just outside the dining room window, to build hers. Love looking at your wreath and basket! An Easter tree, how very fun! I bet your kids loved hanging ornaments. I just saw a tutorial for making bunnies out of baby socks. They were very cute, and looked simple to make. Good work relearning to knit! The learning is slow, but steady. I am trying to learn to crochet. I get just a tad better each time I unravel and start again. If you can, could you provide the http for the knitting pattern you found? Thanks. I am hoping that winter just ups and leaves your area in a hurry! I'm sure you feel you need spring right about now. Have a fabulous day! Josoandsew.wordpress.com is the site where I found the pattern. Basically you knit a square and this site gives directions for sewing it up and stuffing it. Easy and fun. I'm not familiar with crocheting stitches, but if you can crochet something with a tight weave, I imagine you could adapt this project. I got a kick out of Judy's description of her kittens. Cats sure add a lot of fun to a household. Our cat has gotten progressively naughtier as he has gotten older. Thank you, Kris! I'm going to check that out. It sounds maybe easy enough, maybe?! My son adores cats, always has. He used to read something online called the Cat Diaries, or Diary of a Cat, something like that. Anyways, it was the thought process of a cat when they're up their naughtiest most, like how they weave themselves in and out, between your legs, just as you are at the top of a flight of stairs, while maintaining an air of innocence as the owner tumbles down. Our kitty did get bolder and bolder as she got older. I would be so embarrassed when guests would come over and she would jump up onto the kitchen table. People who had never owned a cat would be horrified that I "let" her jump onto the table. I really couldn't keep her off! I just checked out the knitted bunny -- they're adorable, and yes, I think I could do that! This project would be a great way to use odd bits of yarn. Thanks for the site info. Oh, no! We may be over run by knitted bunnies and will have to knit ourselves some coyotes to keep the bunnies in check! If your son likes cats, he should check out Simon's Cat online. They are little pencil drawing cartoons that are obviously drawn by someone who really knows cats. We find them hilarious. Your wreath is beautiful. I wish I had space in my hallway for something pretty, but it's full of coats and boots and mats right now. We'll check out Simon's Cat -- thanks for the tip! Do you have snow all around still? I imagine that it would be hard to think of spring when it still feels like winter. I have a good friend in Edmonton, and she said it was snowing there yesterday. But you know, there is something very beautiful about a clean blanket of snow, too! My Easter and spring decorating is very limited this year as we added two darling and naughty kittens to our home last fall and I don't trust them with my treasures just yet. They are sure that they can play with anything they want and my Easter chicks, ducklings and egg tree would be just too much temptation!! I had to chuckle at the thought of your kittens and their antics! It's true, isn't it, that everything a kitten sees she believes is hers to play with?! We could never put ribbons on Christmas presents to go under the tree, because our kitty would eat them. And just placing things high up wasn't the answer, we quickly discovered. Kitty found every up-high spot I could come up with! I think you're right about the egg tree being too much temptation. I can just picture kittens batting the eggs around! Thanks for commenting. I hope you have a lovely day! You reminded me that I have an Easter wreath with bunnies that I need to put up. Easter comes so early this year, it's kind of taken me by surprise. Your decorations are lovely and I say yes to the bird also. We have several Christmas tree ornaments that are birds. You don't happened to have one you could pull out for your wreath, do you? I know, I'm scrambling to pull together things for Easter (baskets, the dinner, etc). Your bunny wreath sounds adorable! That's a funny mental picture, me taking a bird from our Christmas ornaments. Yes, we have one bird, it was one of my daughter's selections when she was about 6. He's big and purple!! It would delight her to no end to see the purple bird on the wreath. I have a coupon for Hobby Lobby that I'll use if I find a small, natural-looking bird. Thanks for the suggestion! Have a nice evening! I added a chickadee to each the wreath and the basket. I also added the last two flower sprays. 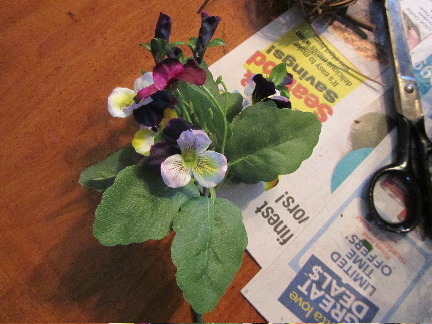 I had thought I'd return them, that there was enough violas on both items, but changed my mine and added those, too. 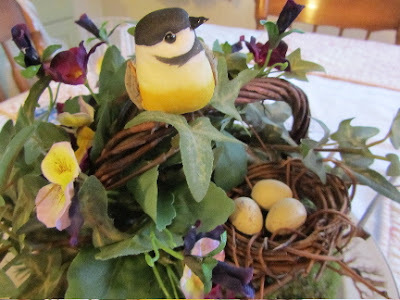 I've posted a picture of the basket with the chickadee at the bottom of the original post. Thanks for your suggestions! I can imagine that it is very difficult to have your child, an only child, move away, whether its temporary or not. I hope you come up with something brilliant to change your focus. Now, decor on the walls, that would probably be one of the few places you could put anything with cats in the house! Although, I'm sure they'll try to get up there! I've had success forcing forsythia about 1 month before the regular bloom time. But I've never tried it much before then. Does it look like your branches have any tiny buds on them? When I cut my branches last month, the forsythia buds were quite tiny, and I wasn't sure they'd bloom, but they did. It's always worth a try. You have nothing to lose, except a few branches. I just love your Easter wreath. So many inspiring ideas here! The scarf you just finished for Bella was so lovely, it has inspired me to take a look into my bag of odds and ends yarn. Oooh, I love those! And yes, the little bird really adds to the basket! Thank you, Veronica. The chickadee does make the whole picture, doesn't it? And thank you for leaving a comment. Welcome!